Are you drowning in fabric, patterns, and supplies? Store your UFOs and WIPs horizontally in Project boxes to save space! Make your own fabric covered Fat Quarter boxes to match your studio! This pattern is simple and very rewarding! Make fat quarter boxes with your favorite fabrics to look great on your fabric shelves in your quilt studio. Store all your sewing tools in style! This adorable portable storage sits perfectly on your sewing table and holds your tools within reach. The silicone insert can be easily removed for cleaning and comes in five different colors! Quick Zip Cases, or other bags. 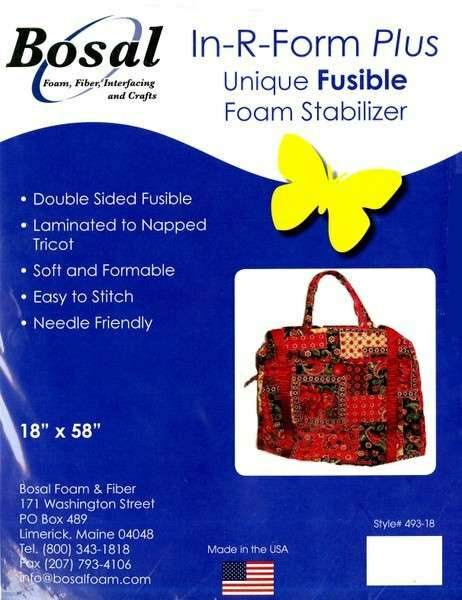 Pattern, pack of 20 mini wonder clips, plus Bosal In-R-Form Unique Double Sided Fusible Foam Stabilizer, you just add your fabric! Make in 4 sizes; Mini 5 inch in diameter x 5 1/2 inch high, Small 7 1/2 x 6 1/2 inch, Medium 10 x 9 inch and Large 12 x 11 inch. Include instructions, diagrams, and paper pattern. 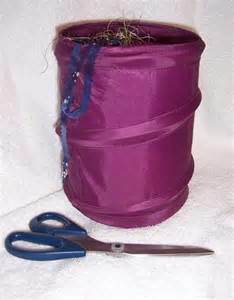 Perfect for catching scraps and threads. Folds flat for transport to class or retreats! Size = 15 1/4" x 10 1/2" x 3"
"Just right to fit on a bookshelf"
Note that a bundle of 50 boxes ship in about 2-3 weeks seperately from your other purchases via Fed ex ground. Available for purchase from me in smaller quantities when I lecture for your quilt guild. 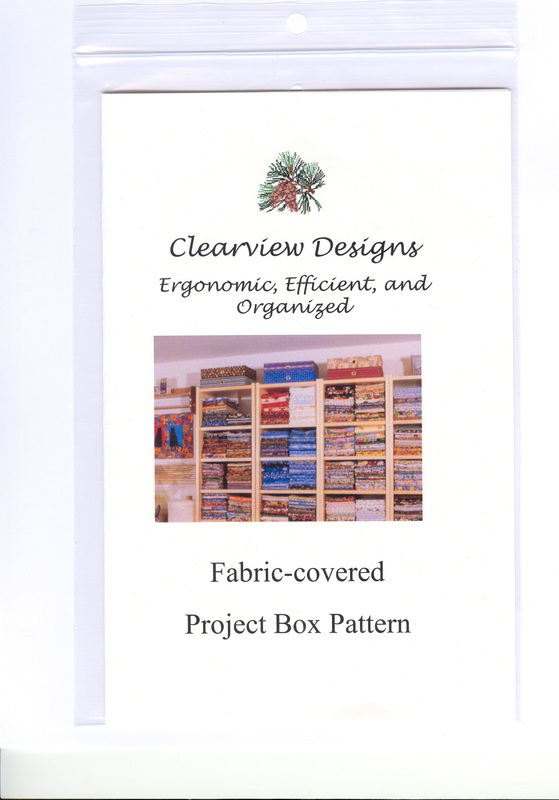 Camouflage your Project boxes with fabric to make them look like fabric on the shelf. They look pretty and help reduce the guilt you feel when you don't finish projects that you have started. 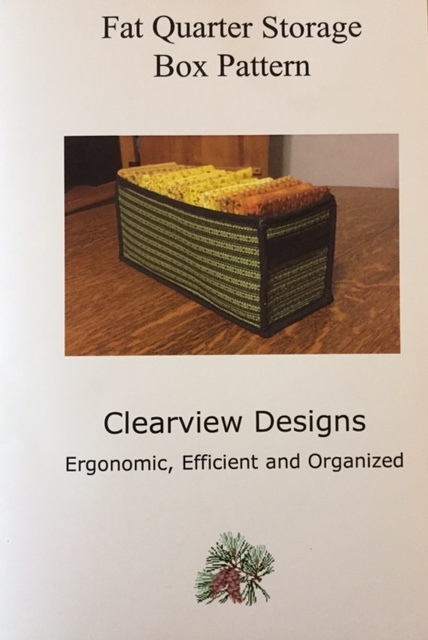 This pattern includes the list of materials you will need and the instructions on how to cover your boxes. Didn't find what you are looking for? Click here for more products.